Resolve. It’s a seemingly insignificant word. Not one frequently used (unless you have to clean your carpet a lot). It’s just two syllables. A mere seven letters. But yet, it is a mighty word for in it determines the success or failure of an endeavor. 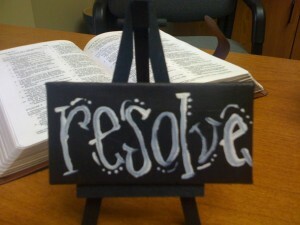 I learned about this “resolve” characteristic last year in a study of Daniel. Daniel and his pals – now they had some resolve! Resolve requires you to make a decision before a decision. It requires planning, discipline – and truth be told – good old fashioned stubbornness. Some people like to use sissy-words like, “determined” or “persistent,” but in my opinion, those are all just poodle-like synonyms for the great dane that is stubbornness. Yep. Stubbornness needs a new image. Stubbornness needs to take perseverance by the horns and show it who’s boss! So, how can we give stubbornness a face lift? We can use our powers for good and not evil. We can use it to complete those resolutions we’ve set for the new year. So, what have I resolved to do this year? What’s my passion? Well, this year, with the help of my awesomely cool and fabulous accountability group, we are reading through the Bible chronologically. So, are you game? Come on! You know you want to roll up those sleeves of stubbornness and do it. All it takes is a little resolve. Posted on January 3, 2011 by Nikol. This entry was posted in Reflections. Bookmark the permalink. I’ll join you! Sorry that I just read this post (I’m a little behind already and the year just started! ).